Still can’t find what you are looking for? Give us a call or email and we will answer any of your questions. Solid wood is the ultimate table top material. Durable, high quality, time tested appearance. 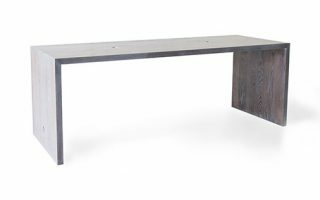 Using high quality hardwoods coupled with strong steel bases our solid wood conference tables are crafted to last a lifetime. Solid wood conference tables can be customized to any size, wood species, or finish. Uses include a conference table, workstation, break room table, meeting table, or kitchen table. Built from solid wood the legs and top are mitered together to create a strong and attractive design. 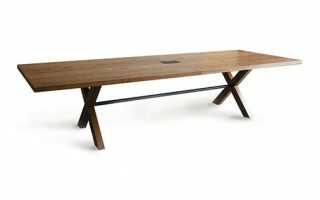 Tables are available in custom sizes, species of wood, and finishes. 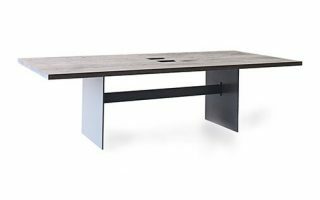 Resting on a steel platform base this piece can serve as a conference table, lobby table, standing table, or other uses. Steel plate elevates the natural slabs of wood to the users height, highlighting the unique grain and live edge. 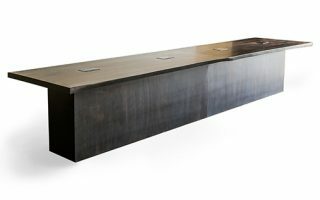 Plinth tables are available in custom sizes, finishes, or wood species. © Greg Pilotti. All rights reserved, 2019. Sign up for email news and updates. We look forward to hearing from you. Fill out our short form and we’ll be in touch shortly. Fill out our short form and we will be in touch shortly.